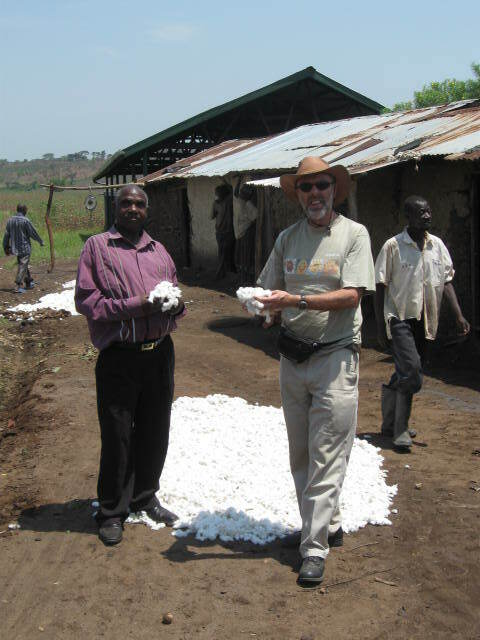 In this photo, I am standing with Mr Adonai, in front of the cotton-processing facilities of Katerera ACE. As a co-operative with over 8,700 farmer-members, Katerera ACE owns perhaps 300 acres of farmland, on which cotton, millet, maize, beans and peas are grown in rotation in the rich volcanic soil. In the past, these crops were sold to the one-and-only local buyer, who would come around with a “take it or leave it” price offer. With internet browsing capabilities provided by the I4H ICTC, Katerera now knows the daily “going world price” for all varieties of coffee, cotton, etc. and contacts potential competitor buyers. Katerera reports an average of 30% better prices received over all their crops, compared with pre-ICTC days. One might assume that such a successful co-op could easily afford “regular” internet access. One would be totally mistaken; at least when I4H first arrived. Regular internet access costs the equivalent of about $50 USD (pretty much the “going world price” of 2 GB of internet data). There is no way that the struggling Katerera farmers could afford $600 USD/yr for any discretionary item. Fortunately, I4H provides “optimized/compressed” e-mail and internet browsing, using only 20% of “regular internet data”. Katerera could afford $10/month. I am happy to report that Katerera DOES now have a 2nd “regular” internet account. Their farmer-members can also afford to send many more of their children to school. But, Katerera ACE continues to use the I4H compressed e-mail, largely because of reliability. In an environment of totally-unreliable internet service, the I4H-protocol e-mail messages are often the only ones successfully sent/received.